During my career I have written plays, musical comedies, and books. 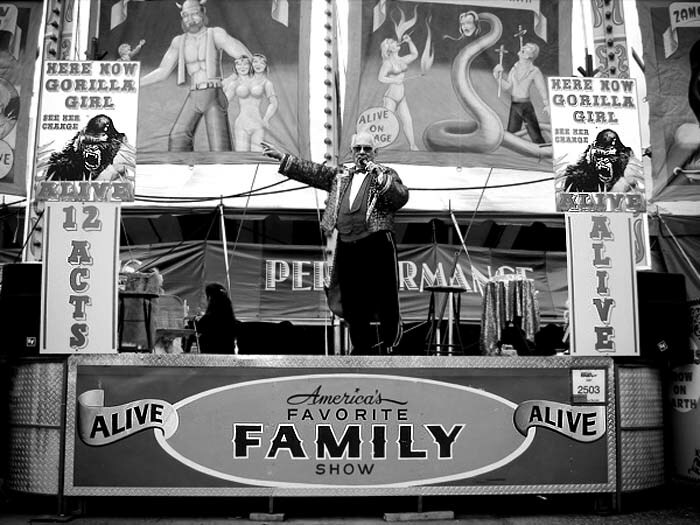 I have performed in movies, TV, live theatre, done thousands of sideshow Ballys (each one in itself is a performance). My rule to make an act or any of the above, or a political speech, a speech at a banquet, or a lecture: talk to your audience, not at them. Speak distinctly, use a correct vocabulary, but one that is tailored to your audience in terms they will comprehend what is being said,, and certainly sound sincere. Even when you're talking re: on a light hearted subject such as a girl show or if it is something you can put drama into, such as creating sympathy for a sideshow performer with a deformity, the content must be believable even if it is a total falsehood. If it is a ventriloquist with A DUMMY THE VENT SHOULDN'T JUST HAVE THE DUMMY SPEAKING WORDS. THE VENT NEEDS TO BRING THE FIGURE TO LIFE. THIS SOUNDS CORNY, BUT IF YOU CAN CONVINCE YOURSELF THAT THE FIGURE IS ANOTHER PERSON SPEAKING TO YOU, EVEN MOMENTARILY YOU CAN CONVINCE YOURSELF THAT IT IS A REAL LIVE PERSON THEN AUTOMATICALLY YOU ARE CONVINCING THE AUDIENCE OF THE SAME. IT IS DIFFICULT FOR A PERSON DOING SAY, TEN SHOWS A DAY OR FORTY BALLYS A DAY TO NOT FALL INTO COMPLACENCY, DUE TO BOREDOM, TIRED-NESS, OR DISTRACTION, AND BEGIN TO SOUND LIKE A BROKEN RECORD, OR END UP TALKING AT THE AUDIENCE IN A SING SONG VOICE. Mainly as you perform, listen to yourself. A lot of people talk without hearing what they are saying or more importantly, how they are saying it. Enough from this old man.